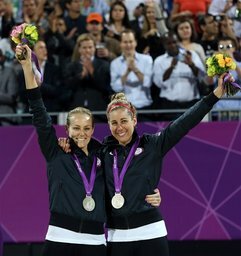 LONDON (AP) April Ross and Jennifer Kessy walked off the Olympic sand with one flag draped over them both, wearing the stars and stripes and also big smiles as the second-best U.S. beach volleyball team. And the second-best in the world. The Olympic rookies lost 21-16, 21-16 to three-time champions Kerri Walsh Jennings and Misty May-Treanor on Wednesday night - and falling short in an all-American final was a remarkable accomplishment in itself for these two. They were never supposed to beat their world power American teammates. They were never supposed to make it to the gold-medal match at all in their Olympic debut at Horse Guards Parade. "We wanted this so bad," Ross said. "Looking at the field when we got here, just looking at our pool and who was in our pool, it was like, 'I just hope we come out of pool.' Then we got first. The field was so tough, coming into this tournament I couldn't imagine going home with a medal." When the reality of what they had just done finally hit them, Kessy and Ross made their way out of the competition arena and fell together into the arms of their coach, Jeff Conover. "We're really proud of what we did here," Ross said. Now, Kessy and Ross have little time to celebrate second place and get over coming so close to their first title of the year. On Monday, a day after they attend the closing ceremony of the London Games, they're off to Poland for a grand slam event that's key for making money and piling up points. The tournament was in the plans all along. "We did some really good stuff. Even though we got silver it's a huge accomplishment," Conover said. "It's the best we've played all year, so to do it on the biggest stage is great. If we're going to lose to anybody it might as well be to more Americans and people in the program and people we like and are friends with." Kessy and Ross showed the world they were serious about joining Walsh Jennings and May-Treanor in making their mark on these Olympics. The pair rallied from a set down to stun reigning world champions Juliana and Larissa of Brazil in a three-set semifinal Tuesday night while playing in a steady rain. They were strong on offense the entire way and made strides in their block defense, too. They impressed their coach with the fight and mental toughness they showed in three-setters. "This is the goal for four years. We're going to just enjoy it," Ross said. "We really can't wait to get home to the U.S. and play domestically and we're probably going to try to recharge for that a little bit." This pair has averaged two tournament wins per year, but is still looking for victory No. 1 of 2012. "Hopefully we take this into Poland and have that attitude of, 'Hey, we want to prove everybody wrong still and silver's not good enough for us and we want to go win a tournament this year,'" Conover said. The 35-year-old Kessy plans to play for one more year before retiring. Ross and Walsh Jennings each said separately Wednesday that they could wind up as partners ahead of the 2016 Olympics in Rio de Janeiro. "She's a winner," Walsh Jennings said. "She's a champion, she's a fighter, she's someone I'd be honored to play with." For now, Kessy and Ross are going to think about what's immediately next and cherish this special run before they play again next week. "We're going to be wearing these medals when we're old ladies drinking coffee by the fire," Kessy said. "This feels amazing."